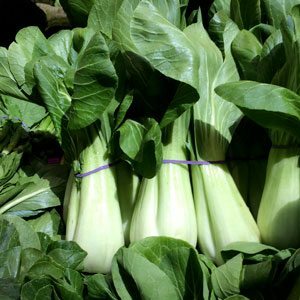 Also known as Chinese cabbage, Bok Choy, also known as Pak Choy is a cool climate leafy green vegetable. In cool climate zones it is best planted in spring or after winter when the soil begins to warm a little. Green and red leafed varieties are available. If you can maintain moisture and life in a temperate climate, them you can grow Bok Choy in the home garden. This is one of the most widely grown of the Chinese Greens and it is best grown from seed. Once you have prepared the soil by digging it over well and adding some well rotted compost, a little blood and bone and some cow manure you are ready to plant the Bok Choy Seeds. In warmer areas it can be grown through winter. You can grow Bok Choy from seed, or from seedlings. Seeds are best started in a propagation tray, seedlings can be planted directly into the vegetable garden, or grown in a container. Growing Bok Choy from seed. Seeds can be planted into trays or containers and started indoors. Or planted directly into the garden. A humus rich soil, or seed raising mix is best. In general they will germinate in around 10 days. Seeds need to be kept moist at all times. As soon as they germinate use a little seaweed fertiliser to improve the growth rate. After germination leave them in the trays for around 2 weeks until they become a reasonable size. Prepare the area where they are to planted by digging in a good amount of compost and some aged cow manure. When the seedlings are ready to plant out to around 30 cm (1ft) apart. From planting out to harvesting will take around 9 weeks in good conditions. If you are planting the seeds directly into the garden sow the seeds at around 10 cm (4 inches) apart and then thin out as they germinate. One problem with sowing directly is slugs and snails eating the new shoots. You do need to ensure that the soil does not dry out, and regular applications of fertiliser will improve the growth rate. Nitrogenous type fertilisers are best. You can either pick the outer leaves as they become large enough or cut the whole plant at the base.